One of the themes of this blog is the technological and spiritual impact of war. One of the strangest ghost stories around that theme concerns Canada's longest serving Prime Minister, William Lyon Mackenzie King. He headed the country for a total of 21 years, intermittently from the 1920s to the 1940s, including the whole World War II period. He never married; a dear friend had died in 1900 (Mackenzie King had his dead friend used as the model for a statue of Sir Galahad, which stands at the entrance to Canada's Parliament Buildings), and most of his family died through the First World War. In the post-WWI-era, he became interested, as many grieving people did, in spiritualism. He is known to have hired mediums to speak regularly to his dead family, especially his mother, and other departed spirits. He used spirtiualist techniques such as table-rapping, and was given a crystal ball by an English psychic. He was also fascinated by numerology and dreams, and kept extensive diaries about his spiritual impressions. This was, again, unorthodox and kept secret during his period in office. But it was not entirely out of step with the times. 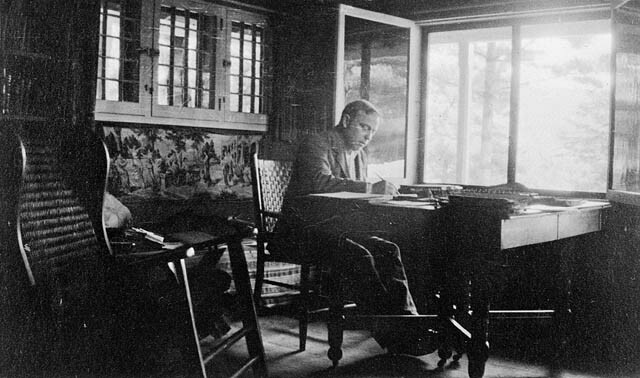 Mackenzie King writing, 1917. Image Source: Wiki. Pillars with Backdrop, part of the 'Abbey' at Kingsmere © Mike Geiger (20 June 2010 All Rights Reserved). 0913-22770007 Kingsmere's fake ruins © by Photosensitive (30 July 2009 All Rights Reserved). Although the fake ruins may seem to some simply to be contrived, odd and in bad taste, researchers and visitors agree that the Hills have a definite mystery about them. Mackenzie King, in his private grief and loneliness, appears to have sensed this atmosphere and responded to it. There is a mood in these old hills. 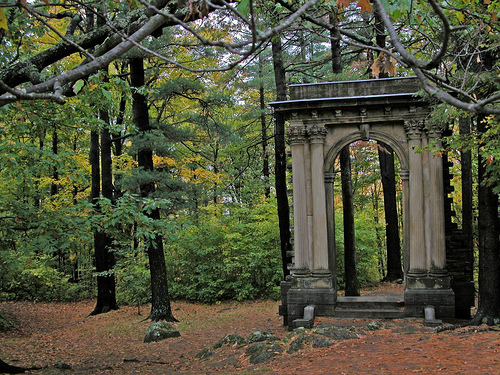 In the United States, towns in the connected Adirondacks range provided the inspiration of The Legend of Sleepy Hollow, Rip Van Winkle and other famous Hallowe'en stories by the writer Washington Irving. Some researchers have mused that the ruins pushed the Prime Minister's spiritualist rituals to the point of inspired national revelation. Certainly, the ruins are positioned between the European past and the New World's future. They are emblematic of the uneasy Canadian national consciousness that is anchored in the wilds of the environment, but was originally shaped mainly by British, French and other European traditions. 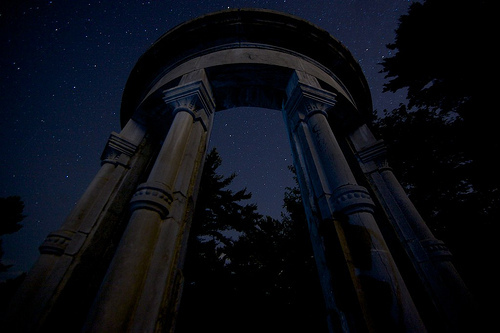 This sensibility inspired Dennis Duffy to observe in 2007: "Kingsmere’s 'ruins' were in King’s personal cosmology the indices to a higher spiritual realm. They were the pillars of the cathedral of a new age of relentlessly idealized faith that had succeeded the collapse of the old, material one. They had ceased being ruins. 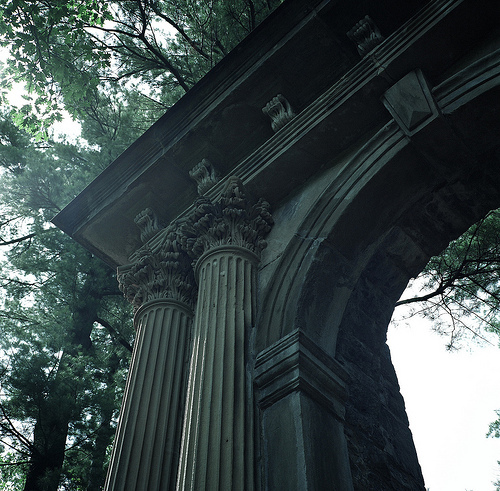 They were now gateways, arcs of triumph." Mackenzie King died at Kingsmere on 22 July 1950. 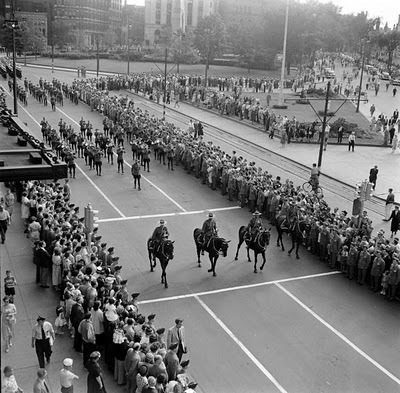 Mackenzie King's funeral procession, Ottawa, 26 July 1950 from St. Andrew's Presbyterian Church on Wellington Street. Image Source: Urbsite. 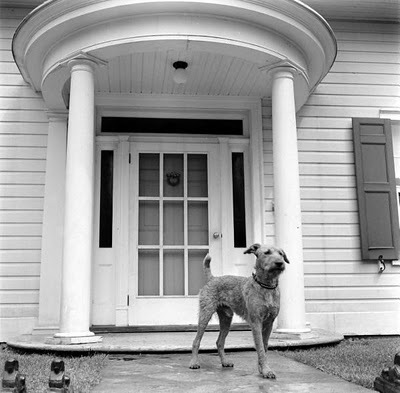 "When LIFE magazine came to photograph the Kingsmere estate in August 1950 they found King's orphaned Irish Terrier waiting at the door." Image Source: Urbsite.